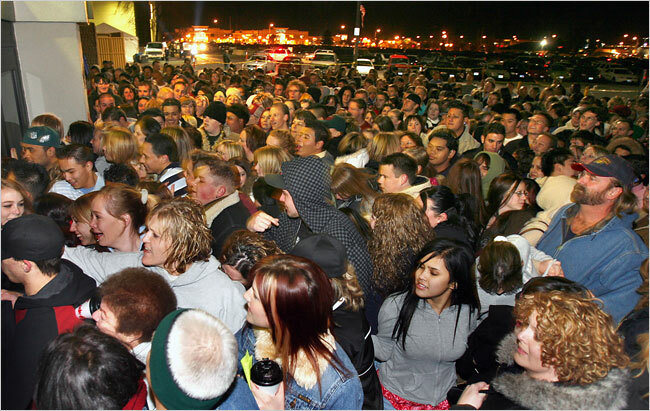 Happy Black Friday to shoppers in the United States. I hope everyone enjoyed their Thanksgiving yesterday. We don’t have a shopping event equivalent to Black Friday in Canada. Boxing Day, on December 26th, used to be a big day for finding bargains, but in recent years the majority of retailers have begun putting most of their stock on sale long before Christmas anyway, and the stores here don’t tend to offer the big loss leaders that I see advertised in the U.S.
I’ve come to appreciate Christmas shopping late at night, and early in the morning, although I’ve never been browsing the aisles at 3:00 or 4:00 a.m. There’s hardly any traffic on the roads, barely any shoppers in the stores, and no one in line ahead of you at the check-out. Several years ago I went to my local 24-hour grocery store around 11:00 p.m. on December 23rd to do my final grocery pick-up before Christmas and realized it was an excellent time to be there. I enjoyed strolling the aisles without having to manoeuvre around dozens of others, humming along to the Christmas music and chatting with the staff who, also relieved that the store was deserted, were cheery. When Walmart began staying open all night in December of last year, I went shopping there one evening around 11:30 p.m. Again, perusing the stock in peace and picking out the latest toys was a relaxed and pleasant experience. Hey – whats up. Thanks for the info. I’ve been digging around for info, but there is so much out there. Yahoo lead me here – good for you i suppose! Keep up the good work. I will be coming back over here in a couple of days to see if there is updated posts. Thanks for your encouragement Alex. I’ve been taking a bit of a break from blogging this month, since there are so many other things to do at this time of year, but I plan to get back to it after Christmas.